Ham and Cheese Hot Pockets: Ham and cheese are enveloped in a soft hot pocket–perfect for dipping! Ditch store-bought and serve up these Homemade Hot Pockets for a family-friendly meal or a perfect on the go lunch. I have a confession to make. I ate Hot Pockets in college. I was in desperate need of some quick and easy meals I could make right in my dorm room, and when I saw Ham and Cheese Hot Pockets, I thought it was a good idea. Just microwave and eat. I must tell you, I did not love store-bought hot pockets. In fact, I rarely have them another thought, until I made my own version at home. After a trip to BJ’s to pick up some DELI meat and cheese for school lunches, I had the idea to make Ham and Cheese Calzones for lunches instead of just sandwiches. And that is exactly what I did–but when my husband came home and grabbed a warm ham and cheese calzone off the cooking sheet, he said, Wow, these are really good Homemade Hot Pockets. Flashbacks of college and dorm room hot pockets were dancing in my head. And I made a face of disgust but then realized I actually LOVED Homemade Hot Pockets. But regardless of what you call these ham and cheese pockets, the soft dough wrapped around salty ham and creamy cheese is irresistible–and of course homemade tastes a heck of a lot better than anything you find in the freezer aisle. With the bargains found at BJ’s Deli Counter, you can make these Ham and Cheese Hot Pockets for pennies a piece. And of course you could also use any Deli meat or cheese your family likes. BJ’s carries a large selection. I use my homemade pizza dough, but 1-pound store bought dough works as well. Divide the dough into 8 equal pieces and roll each piece into about an 8-inch oval. Evenly divide ham and cheese between ovals, placing on center of bottom half of oval. Fold the dough over, creating a crescent shape and using your fingers or the prongs of a fork, tightly seal the edges of the “hot pocket”–just like you would for a calzone. Place the hot pockets onto a baking sheet lined with parchment paper or that is well greased. Cut 2-3 slits across the top of each hot pocket to allow steam to escape while baking. Bake for 12-15 minutes, until dough is nicely golden brown. There is something magical about a hot pretzel. And when you pair a warm pretzel with ham and cheese, magic really happens! Homemade pretzel dough is just as easy as homemade pizza dough. The recipe for the dough remains the same, there is just one additional step needed to turn ordinary dough into pretzel dough. After your hot pockets have been assembled, instead of brushing them with an egg wash and placing in the oven, you need to parboil your hot pockets in water that has been “seasoned” with baking soda. The baking soda creates a reaction in the dough, to give it the distinctive pretzel flavor. Prepare Ham and Cheese Hot Pockets up to step filling and sealing the homemade hot pockets. Once the water has come to a boil, turn the stove off and stir in ¼ cup baking soda into the water. Gently place each hot pocket into the water bath, one at a time, just until coated with the mixture. Remove hot pocket from water bath with slotted spoon and place on parchment lined baking sheet. Cut 2-3 slits in each hot pocket. I highly suggest making a large batch of these Ham and Cheese Hot Pockets and freezing them for a quick dinner or to pack for lunches. Place fully cooked hot pockets on a baking sheet and place in freezer. Freeze until outside is solid–30-60 minutes. Place frozen Hot Pockets in freezer safe bag for up to 3 months. To Heat in Microwave: Place in microwave for 2 minutes. Let cool 2-3 minutes before eating. To Heat in Oven (preferred Method): Place on baking sheet and place in 400-degree oven for 12-15 minutes. To Heat in Microwave: Place in microwave for 45 seconds. Let cool 1-2 minutes before eating. To Heat in Oven (preferred Method): Place on baking sheet and place in 400-degree oven for 5-8 minutes. 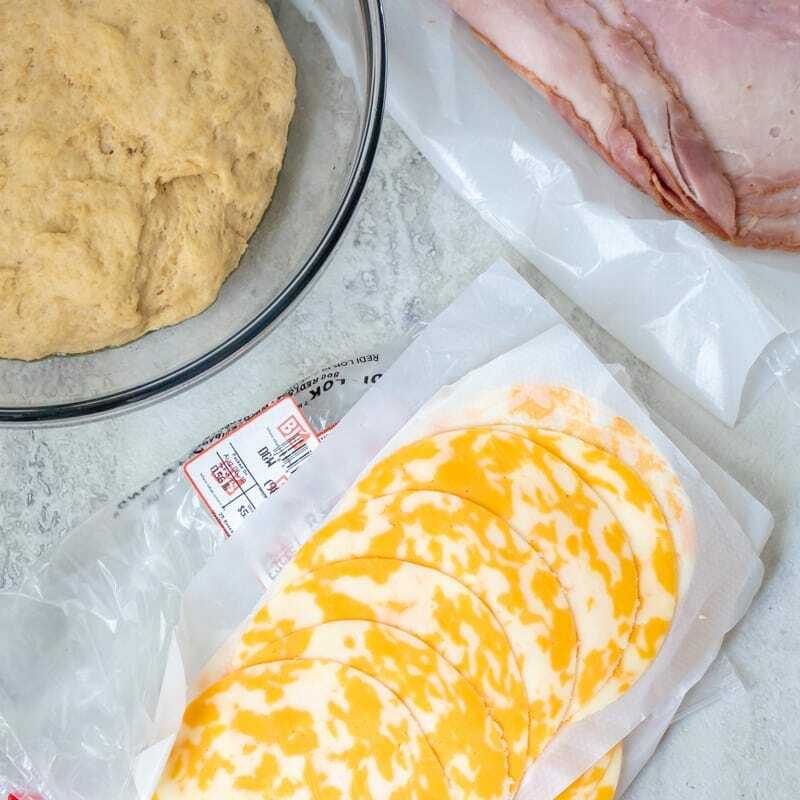 Taking a homemade ham and cheese Hot Pocket to school or work is a great option for a filling lunch. You have several options as to how to take pack them in lunches. If your office/school has a microwave, place a homemade hot pocket (frozen or from fridge) wrapped on wax paper in a lunch bag with an ice pack. Heat the hot pocket right on the wax paper in the microwave and then enjoy. If you don’t have access to a microwave, heat hot pocket in the morning before leaving for school or work. Place in thermos and your hot pocket will be warm and ready for your lunch. If you like your hot pockets room temperature, heat hot pocket in morning before leaving for school or work. Pack warm hot pocket in lunch container along with an ice pack (this keeps the hot pocket from developing bacteria) while sitting in a locker or at an office desk. 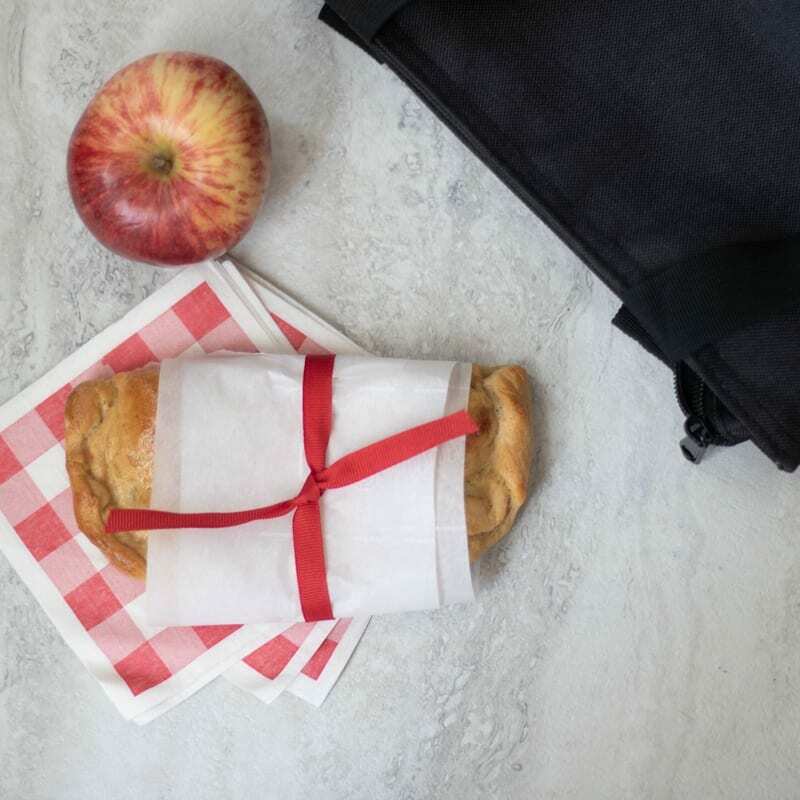 Grab an apple and Homemade hot pocket and your lunch is complete. I used BJ’s Deli Ham and Cheese slices for these homemade ham and cheese hot pockets, but you can also use leftover ham if you have it. Colby Jack Cheese was my family’s preferred cheese for this, but Swiss, cheddar, and provolone are all good options. I love to make homemade pizza dough for to use for hot pockets–but store bought pizza dough works as well. 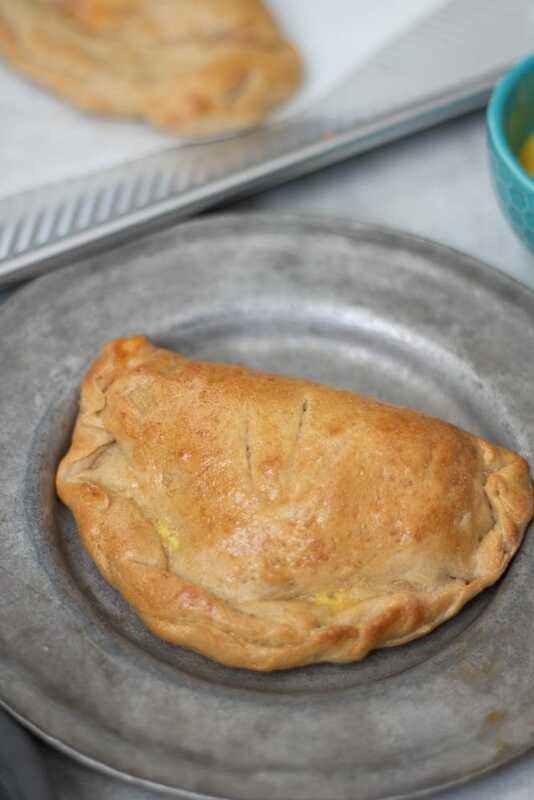 To make EGG FREE Hot Pockets, either prepare these as Pretzel Ham and Cheese Hot Pockets, or brush with olive oil before baking instead of the egg wash.
Ham and Cheese are baked into a homemade hot pocket for a salty, cheesy, savory perfect hand-held meal or on the go lunch. Divide the dough into 8 equal pieces and roll each piece into about an 8 inch oval. Evenly divide ham and cheese between ovals, placing on center of bottom half of oval. Fold the dough over, creating a crescent shape and using your fingers or the prongs of a fork, tightly seal the edges of the "hot pocket." Bring a large pot of water to a boil. Once the water has come to a boil, turn the stove off and stir in ¼ cup baking soda into the water. Gently place each hot pocket into the water bath, one at a time, just until coated with the mixture. Cut 2-3 slits across the top of each hot pocket to allow steam to escape while baking. Whisk egg with 1 tablespoon water and brush each hot pocket with the egg wash. Cut 2-3 slits on top of each hot pocket to let steam escape while baking. Bake for 12-15 minutes or until dough is golden brown. I used BJ's Deli Ham and Cheese slices for these homemade ham and cheese hot pockets, but you can also use leftover ham if you have it. Colby Jack Cheese was my family's preferred cheese for this, but Swiss, cheddar, and provolone are all good options. I love to make homemade pizza dough for to use for hot pockets--but store bought pizza dough works as well. Such a classic flavor combination! I love that you dipped it too. So fun! These look amazing and your step by step instructions make it easy (easy enough that I think I can even do it!) Thanks! Yes Angela, Totally easy enough for you to do!!! Promise! Love the “made with real food” aspect! That, and the delicious pretzel crust! These looks so amazing, you’re right that they’ll catch some jealous glances! I was the same when I was young — I didn’t eat most of the things my school friends did. That’s just fine, and glad your son thinks so, too! Great recipe! Love the soft pretzel pocket! A pretzel dough hot pocket? You ARE an evil genius! Oh wow, these sound amazing! I am loving the pretzel “pocket”! Pretzel hot pockets!!!! Genius. These must have scored you a lot of points with Tate and all the family!!!! My family would eat these so fast and be looking for more! Great job Kristen! Wow, this sounds so amazing! I would definitly eat a couple of these with a nice big bowl of soup! Oh, pairing these with soup is a fabulous idea!! Funny how our food preference totally shape our children’s. I hate peas to this day because my mom does. We never had them. I know it will be the same for my daughter too. In a way I am happy for exposure from others but also want to make sure healthy choice are key. DIY versions are so fun to try out. Love this one! 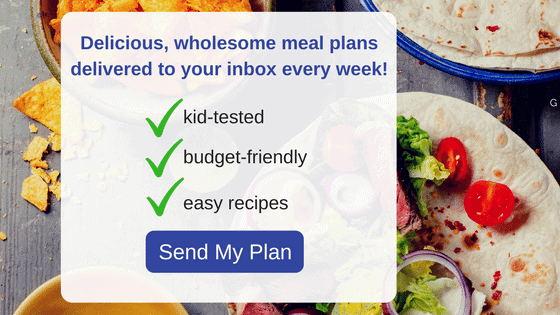 As long as healthy eating goes on at home, I am sure your kids will catch on to healthy eating! Thank you Lindsay! Glad you enjoyed. This is such creative and fun recipe! Thank you for sharing! I was sold at the pretzel dough! A warm, stuffed pretzel sounds so good right now! I prefer the hot pretzel dough every time! OK my house loves hot pockets! I have never thought of this but it sounds so easy & fun to make. I am sure you could even do pepperoni and cheese. Awesome! Pepperoni and cheese work great too Britni! I can’t believe it took me this many years to try making hot pockets at home. These are so tasty and easy. A family favorite now that I’m sure we’ll be making on a regular basis! Yum! YAY Meagen! I am so glad your family enjoys these as much as mine does. 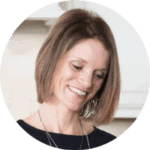 Hi Kristen, Thanks for your wonderful recipes. I am confused with this one though. The recipe says to use pizza dough, but then there are so many comments about pretzel dough. There is a link to your pizza dough recipe but I didn’t see a link to a pretzel dough recipe. I watched the video a few times because it looks like a wonderful dough you are making, but I can’t tell if you are making pizza dough or pretzel dough. (I don’t have sound on so maybe you say it). And I can’t tell whether your machine in the video is a mixer or a food processor. It looks like a food processor but there are no instructions in the printed recipe for a food processor, just mixer or bread machine. 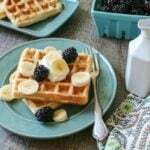 If you have a chance I’d love your help, as I would really like to try this recipe. Thanks so much! Hi Elizabeth! Sorry for the confusion. First, I am using a mixer–it does look like a food processor, but just an open mixer 🙂 Secondly, I have included recipes for how turn pizza dough INTO pretzel dough if desired. Pretzels are made by placing the pizza dough quickly into a solution of warm water that baking soda has been dissolved into before baking. So you can make these hot pockets just with plain pizza dough or take the extra step to enjoy as pretzel hot pockets. Hope that helps. Yes it did, thank you! And thank you for sending the reply to my email and so promptly. I made these last night! They came out great. I will leave a review separately. Thanks again! I am happy to help ANYTIME! Made these last night and they were delicious. Was in a rush so used store bought pizza dough and did the baked method. Did half with ham and cheese (put mustard right in them as I thought hubby might take in car to dd’s basketball game. Did the other half as pepperoni pizza pockets. We all loved them and I will make again. I found snipping with kitchen shears was easier than cutting slits. Thanks again! Right now the family naps while we await your instant pot lasagna.